Prabhupāda: His Guru Mahārāja advised him. Prabhupāda: No, it is the safest place. In a linen handkerchief, bound up. Yes. So it is safe always, kaṇṭha. My father used to carry. Wherever he would stay, gaṅga-jala, tulasī, decoration. So half an hour business. My father was a great devotee. Yes. Devotee: You dedicated the Kṛṣṇa Book to him. Prabhupāda: Yes. Because he was a pure Vaiṣṇava. And he wanted me to become like this. He was praying Rādhārāṇī. He was praying to Rādhārāṇī. And any saintly person would come, he would simply say, "Give blessings to my son that he may become a Rādhārāṇī's servant." That was my father's prayer. He never prayed that "My son may become very rich man." He never prayed like that. Actually, his ardent desire that his son may become a Vaiṣṇava. And my Guru Mahārāja's training has put me this position. That I have admitted, later on. What is that word I have given? Hmm? Find out. Devotee (2): "The eternal father"? Devotee: "Which was later on solidified..."
Devotee: "...by my eternal father." Prabhupāda: "The ideas given by my father were solidified by..."
Devotee: That's what you said. 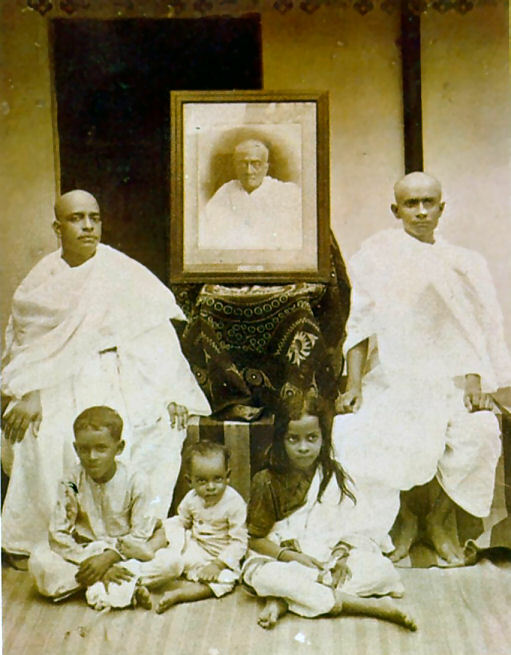 Devotee (2): "To my father, Gour Mohan De, 1849–1930, pure devotee of Kṛṣṇa, who raised me as a Kṛṣṇa conscious child from the beginning of my life. In my boyhood ages he instructed me how to play the mṛdaṅga. He gave me Rādhā-Kṛṣṇa vigraha to worship, and he gave me Jagannātha ratha to duly observe the festival as my childhood play. He was kind to me, and I imbibed from him the ideas later on solidified by my spiritual master, the eternal father." Devotee (2): Yes, very poetic. Prabhupāda: That is a fact. I got good father and good spiritual master. That's all. Devotee (2): We have gotten bad father, but now we have spiritual father. Prabhupāda: No bad father. Unless good father, son cannot be good. Yathā yoni yathā bījam. Devotee (3): They must be just fallen. Devotee (2): They have not accepted your mercy. Devotee: They'll all benefit by the son's devotional service. It doesn't matter how fallen they are, you know. Prabhupāda: My father never chastised me. Hmm. Devotee (3): But I think you said your mother was always very strict. Prabhupāda: Because he was very lenient. So mother had to be little strict for my education.